I’ve said it before and I’ll say it again, there is nothing better than Peeps® for candy. They are soft, sweet and so good. Valentine’s Day has to be one of my favorite times to get Peeps. Not only do you get the marshmallow goodness, but they even come dipped in chocolate. That is a win win. · PEEPS® Valentine Hearts: Express your love with eight sparkly red marshmallow mini hearts. This new item is adorned with a write-on tag for personalized gifting! · PEEPS® Chocolate Dipped Strawberry Crème Flavored Chicks: Three delectable strawberry crème flavored marshmallow chicks dipped in smooth milk chocolate – perfect for the ones you love. · PEEPS® Marshmallow Hearts: Available in 2 or 6 count packages, these pink heart shaped marshmallow hearts help show your sweetheart that you do know the way to their heart! · PEEPS® Strawberry Crème Flavored Marshmallow Hearts: Nine red marshmallow hearts with the delicious taste of strawberries and cream are perfect as a Valentine’s dessert treat or as a fun accent to your favorite craft or recipe. · PEEPS® Cherries Drizzled and Dipped in Chocolate: Three cherry-shaped marshmallow flavored cherries dipped in and drizzled with decadent chocolate, perfect for sharing with that special someone. · PEEPS® Vanilla Crème Flavored Marshmallow Hearts: Nine vanilla crème flavored marshmallow hearts sprinkled with red flecks are a perfect snack to share, or delicious as a fun topper for hot cocoa. 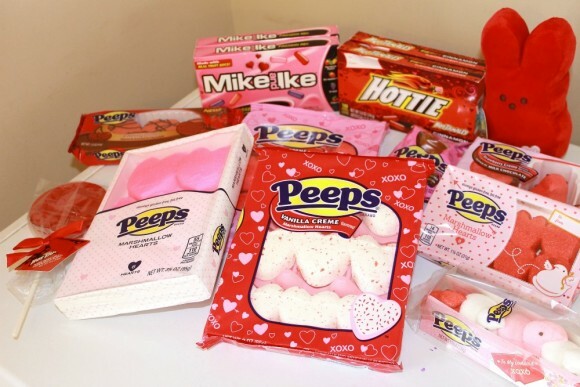 · PEEPS® Chocolate Covered Raspberry Flavored Heart: Individually wrapped raspberry flavored marshmallow heart covered in milk chocolate makes for a treat you can keep to yourself or share with your Valentine! · MIKE AND IKE® Passion Mix Candy: Feel the love of the season with the limited edition MIKE AND IKE® Passion Mix – a fruity and chewy assortment of Paradise Punch, Strawberry, Grape and Cherry in festive holiday colors. · HOT TAMALES® Fierce Cinnamon Candy: Spice up the special day with the original bold and fiery flavor of HOT TAMALES® Fierce Cinnamon! The festive box features a personalized tag – perfect for gifting in the box or using to craft something spicy for your favorite “HOTTIE”. · HOT TAMALES® Valentine’s Lollipops: If you’re feeling extra bold and spicy this Valentine’s Day, the HOT TAMALES® Valentine’s Lollipops are sure to deliver! Available in circle and heart shapes, this fiery treat is a cinnamon-lovers dream! · PEEPS® Plush Valentine’s Day Bunny: These fluffy 5-inch bunny-shaped plushes are squeezable and soft – perfect for hugs and cuddles. Available in red and pink, with a stitched heart that will show a special someone how much you care. So what is a girl to do with all these Peeps®? 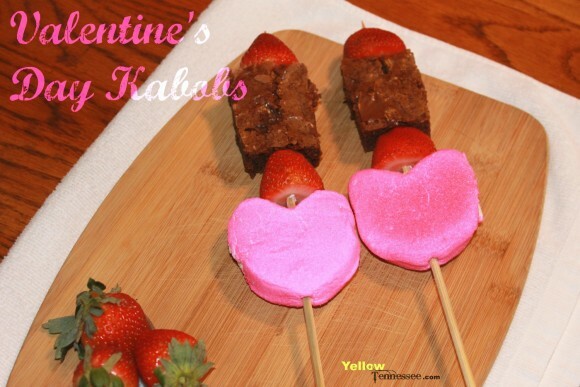 Make some Valentine’s Day Dessert Kabobs with Peeps® of course. These are so easy. All you need is some skewers, brownies, some fresh fruit (I used strawberries), and some Valentine’s Day Peeps®. Simply add your treats to the skewers in any pattern you wish.